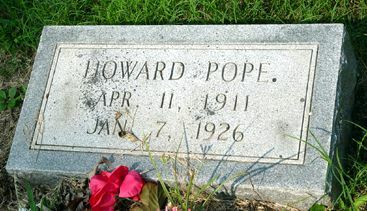 Howard Pope, son of Calvin D. "Cabe" Pope and Alba Abernathy. Friends in Cartersville were grieved to learn Thursday afternoon of the death earlier in the day of Howard Pope, the fourteen year old son of Mr. and Mrs. C.D. Pope, who reside in the Euharlee community. Funeral services were held Friday at Macedonia Church with interment in the nearby churchyard. The young man had been suffering from an attack of typhoid fever, and was thought to be improving, when he suffered a relapse and passed away. His death is particularly sad, in view of the fact a brother was fatally hurt some months ago when he dived into the river and broke his neck. Note: His brother was Covington (Buddy) Pope who died August 29, 1924 in diving accident.